The November 8 Myanmar general election was regarded by both local and international watchers as the country's first credible election. The election represents a critical milestone for this fledgling democracy; however, Myanmar's future political, social, and economic trajectory depends heavily on the transfer of power and ensuing formation of government and how the new ruling party is able to govern. The official results were finalized on November 20 with the main opposition party, the National League for Democracy (NLD), emerging as the clear winner. The election not only handed the NLD a long-awaited win, but also framed questions and exposed rising or falling fortunes for everyone interested in Myanmar's future. Aung San Suu Kyi and the NLD: Aung San Suu Kyi's NLD secured a landslide victory in both houses of parliament and in the State and Regional Assemblies; the NLD's margin of victory allows it to form the new government without a coalition. The NLD will hold nearly every major office--President, one of two Vice Presidents, Speakers of both chambers of parliament, and the cabinet--with the exception of the other military-appointed Vice President and the Ministers for Defense, Home, and Border affairs. Aung San Suu Kyi remains constitutionally prohibited from becoming President. However, she has made it very clear, amidst some controversy, that she intends to take a role "above the presidency" (even though the constitution prevents anyone from being "above" the presidency) and that the yet-to-be revealed NLD President will make all decisions solely along party lines. Foreign Direct Investment: Aung San Suu Kyi's international image and the NLD's recently stated commitment to financial sector reform to attract international businesses should provide a boost to foreign investment, particularly from those who have treated the Myanmar market cautiously. In the past two years, Asian companies have flocked to Myanmar, increasing foreign direct investment (FDI) five-fold to US$8 billion in the 2014/15 fiscal year. Meanwhile, most Western businesses sat on the sidelines and many never moved past the 'window-shopping' stage, feeling that the political and reputational risk associated was too great and the return on investment too small. The NLD win has significantly diminished those concerns. Myanmar can expect an influx of western businesses within the next fiscal year, although many are anxious to know the NLD's specific economic policies and approach to FDI. The United States: With a peaceful and successful election accomplished, the Obama Administration's Myanmar policy emerges as a clear success. Myanmar, particularly Aung San Suu Kyi and the NLD, enjoys strong--and rare--bipartisan support in Washington, and her party's victory almost certainly ensures better relations between the U.S. and Myanmar. On November 19, Senate Majority Leader Sen. Mitch McConnell and Sen. John McCain introduced a resolution congratulating Myanmar on its election won by the opposition party in which it "calls upon the President to take further steps toward normalization of relations with Myanmar and consider the potential relaxation of restrictions should the USDP and Military respect the election results and proceed with a prompt and orderly transition in power". The U.S. is however unlikely to announce major policy changes or dismantle sanctions entirely before the NLD government is firmly in place and the country's political trajectory continues to move forward. The Union Election Commission: The UEC was subjected to much criticism for voter list errors during the pre-election period. However, the Election Day itself was widely viewed both by local and international observers as a success. There were reportedly as few as 12 instances of electoral violence on November 8, and observers noted that the process was relatively free and fair. There remain some issues, including advanced voting irregularities and pre-cast ballots, as well of course as the inability of nearly 2 million citizens abroad to cast votes, and the exclusion of Rohingyas and others from the voter list. At least for now, these issues were overshadowed by how well Election Day was managed. Thein Sein and the USDP: The results announced on November 21 confirmed the electoral annihilation of the ruling Union Solidarity and Development Party (USDP). Many USDP members believed the party would lose its majority, but few expected the losses to be so staggering. Many high level USDP officials, including Party Chairman Htay Oo and Lower House Speaker Shwe Mann, surprisingly conceded early on, and President Thein Sein and the military promised a peaceful transfer of power. The voters clearly were not swayed by the party's record while in government, or by Buddhist nationalist support for the USDP. Thein Sein is unlikely to serve a second term; the military can select a nominee for the president, who will at least serve as a vice president, but will probably choose current Commander-in-Chief Min Aung Hlaing or someone else similar. Thein Sein and the USDP will likely conduct a post mortem to examine their loss, but it is readily apparent that the electorate did not just cast votes for the NLD, they were also cast against the military. Ma Ba Tha and the 969 Movements: Myanmar's increasingly vocal Buddhist nationalist movements, personified in the Organization for the Protection of Race and Religion (Ma Ba Tha) and 969 organizations, actively sought to influence the election by outwardly supporting the USDP and Thein Sein, particularly for his role in passing the controversial race and religion laws, and deriding the NLD. Many election watchers--as well as prominent extremist monk U Wirathu--thought the movements would garner votes for the USDP and limit enthusiasm for the NLD, especially in rural areas. He has since cautiously acknowledged his surprise at the NLD win; he is probably more shocked that he was unable to convince the massive crowds attending his lectures to vote for the USDP. U Wirathu has already warned the NLD to leave the race and religion laws untouched. While unlikely to directly attack Ma Ba Tha or 969, the NLD has already challenged the movements and will mostly likely seek ways to curb their influence while preserving its own religious stripes. The NLD could easily achieve this by aligning themselves with leaders of the increasingly popular anti-hate speech campaign, 969's counter movement, which comprises a new wave of progressive monks, civil society leaders and women's rights activists. Ethnic Parties: Perhaps one of the more surprising aspects of the election are the losses incurred by the ethnic parties, particularly in the State and Regional parliaments where they were expected to claim big wins. Popular ethnic parties such as the Shan Nationalities League for Democracy and the Arakan National Party secured the highest number of seats, but only captured 1-3% of the seats in both houses of parliament. With an NLD supermajority and no need for coalition governance, ethnic parties could be marginalized and have little say in policymaking. The NLD will very likely govern in a highly centralized manner and tensions could emerge in the near future if ethnic representatives are not involved in major decisions. Their only certain leverage in parliament is in amending the constitution, a process that requires all non-military members of parliament plus one military vote. With regards to the ongoing peace process, three major ethnic rebel groups in northeastern Myanmar's Shan state - the Myanmar National Democratic Alliance Army (MNDAA), Ta'ang National Liberation Army (TNLA) and Arakan Army (AA) - have recently vowed to support a new government led by the NLD and end all ongoing conflict in the Kokang self-administered zone. While still early to tell how well the NLD will do in the overall peace process, this is definitely a good sign. Rohingya and Muslim minorities: The Thein Sein Administration exploited growing Buddhist extremism in the country and targeted Muslim minorities through passage of race and religion protection laws, which were popular with the public and thought to have potential to sway voter opinion in the administration's favor. Aung San Suu Kyi and the NLD remained virtually silent on the subject, likely to limit a loss of voter support, but did acknowledge that the anti-Muslim rhetoric and violence is an issue. Aung San Suu Kyi has responded to criticism from the international community on her lack of engagement on the issue citing her party's minority status in government limits as an impediment. An NLD victory will, by no means, ensure an end to anti-Muslim discrimination in Myanmar. 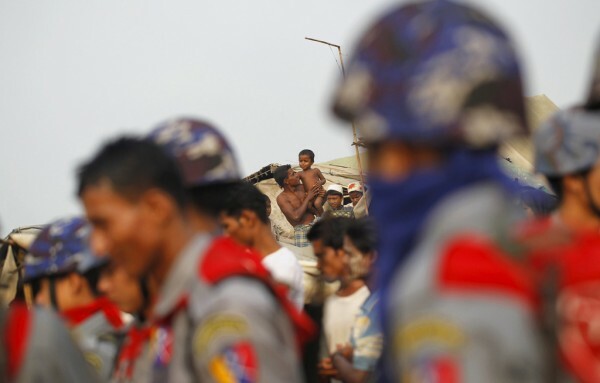 But the international community can expect there to be a reasonable long-term solution to protect and (eventually) include Myanmar's Rohingya and Muslim populations. Military: The military-backed USDP was unable to secure a parliamentary majority or even enough seats to form a coalition with the military or mount a credible opposition. Despite what could be perceived as a clear loss, the military still remains Myanmar's most powerful institution, and its role is secured through powers granted by the 2008 constitution. In addition to a guaranteed 25% of the seats in all parliamentary bodies, the military controls three major ministries (Defense, Home, and Border Affairs), and has the authority to declare a State of Emergency and again usher in military rule at any time for reasons of national security. Even with an NLD government, it is unlikely that these constitutional provisions will be amended in the short term; the previous and only attempt so far to amend the constitution was blocked earlier this year. Additionally, parliament holds no oversight of the military budget or jurisdiction over military-related criminal affairs; prosecutorial powers are governed by a court martial system. The military has stated publicly that it would honor the victory of Aung San Suu Kyi's NLD, and has expressed willingness to work together with the new government, at least for now. Lower House Speaker Shwe Mann: Shwe Mann's work as Speaker, his ties to Aung San Suu Kyi, and his recent removal from the USDP Chairmanship due to disagreements with military hardliners, have collectively reshaped his public image. He went from being reviled by the general public to one of the most admired political figures. However, his rise in popularity has meant the loss of the military and USDP's trust. He does not have the NLD's full support and backing either. Aung San Suu Kyi may find a role for him in her new government, though she has affirmed he will not take the presidency. Regardless, it appears that the events of this year area temporary setback for Shwe Mann, and he may find new roles in politics and in future administrations. China: China maintained "a special relationship" with Myanmar throughout its several dictatorial periods. Prior to the transition, China provided the ruling junta political protection in the international community in exchange for favorable economic treatment, including import and export contracts, earmarked tenders, and deals in Myanmar's extractive industries and energy sectors. Despite diversified foreign investment since Thein Sein's government took office in 2011, China consistently remains one of the top investors in Myanmar's economy. However, bilateral ties have deteriorated in the past few years due to growing anti-Chinese sentiment, driven by the scale of Chinese interest and involvement in exploiting Myanmar's natural resources, and President Thein Sein's shift to a populist agenda tapping this sentiment. China still maintains close ties with Myanmar's military. Despite these strains, even Aung San Suu Kyi knows Myanmar cannot afford to abandon China in its embrace of the West, as their economic ties are too deep and the countries are geopolitically and culturally intertwined. Her record in dealing with China has demonstrated diplomatic savvy. When Aung San Suu Kyi's committee investigated the controversial Chinese-operated Letpadaung copper mine, accused of damaging the environment and producing few jobs for Myanmar economy, she sided with the Chinese and told the residents to end their protests because Myanmar could not risk alienating foreign investors, particularly China. Additionally, during her first official visit to China in June 2015, Aung San Suu Kyi declined to comment on imprisoned fellow Nobel Peace Prize winner Liu Xiaobo, to the dismay of human rights watchers. She recently pledged, following her victory, to pay "special attention" to bilateral ties, adding that foreign investments would need public support to help improve relations. In an interview with China's state-run Xinhua news agency, Aung San Suu Kyi said Myanmar had no enemies, but relations with neighbors were more sensitive than others and needed to be carefully handled. "Ties between neighbors are always more delicate than that between countries far apart. We'll pay special attention to our relations in order to make them smooth, effective and clear." Therefore, the NLD electoral win can be seen as having a balanced, if not potentially positive, impact on China. Civil Society: Many well-known pro-democracy activists and groups--including the popular 88 Generation Students--were not included in the NLD's candidate list prior to the election, and some who ran independently lost in the election. Nonetheless, prominent civil society leaders have come to collectively support the NLD's victory as their own. The question remains as to whether CSOs will play an instrumental role, if any, under an NLD government. For one, their joint work on voter education and constitutional amendments show promise for further collaboration. Additionally, Aung San Suu Kyi's attempts to distance herself from her activist image (the human rights icon that international media has portrayed her to be for the past two decades) and move into a political one, both locally and internationally, calls for the need to have a purely activist-oriented platform that she can indirectly be involved in but distance herself, if need be, without taking a political hit.